My calligraphy kindred are preparing to travel and gather at Saint John’s University in Minnesota for the annual summer calligraphy conference next week. For them and all of us writers, I offer this Script Goddess, the Nursing Mother of Rast, from the Old European Vinca culture in western Romania. 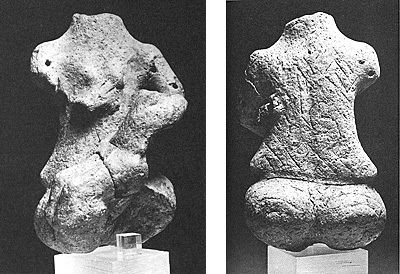 She is at least 7000 years old, and about 12 centimeters high, her size easy to hold in the hand. Her nursing child at her breast and the markings on her back and sides are clearly a form of writing on the female body. The child is also inscribed. 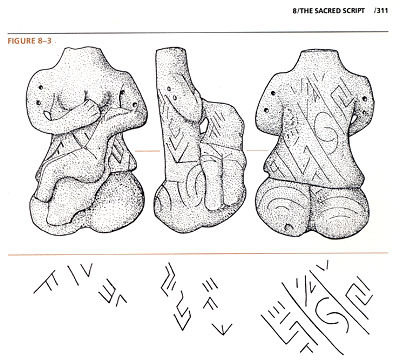 Shown above is the drawn schematic of these markings, separated from their rough background, so that a kind of writing can be seen, and below it a photograph of the figure. It is powerful to see these incised lines, and as a scribe, to imagine making them into this clay, so many thousands of years ago, for what reason? Prayer? Protection? Incantation? Veneration for the life-giving mysteries of women’s bodies? When I read about breastfeeding women who have to “express” their milk for their newborns in toilet stalls at their workplace (in the Dear Abby advice column this morning) I think of this and other ancient statues of women offering their breasts as a sacred act. And I think of writing too as a creative, sacred, nourishing act. When I found the photo of this madonna, it was the two facing crescents I suddenly recognized. 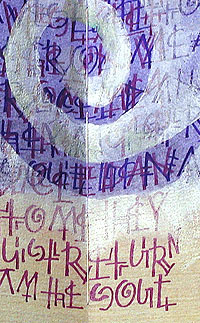 I used it as my “S” when I invented my goddess alphabet in 2003, based on a catalog of marks Marija Gimbutas had made in The Civilization of the Goddess. You can see both the double spiral and the “S” in this detail from my book Charge of the Goddess, in which I made generous use of these symbols. As Joan Marler recently explained to me: “The two facing crescents – when positioned to make the S shape – are special indeed. They define the place, in the center of the double spiral, where the inward direction turns to spiral outward. 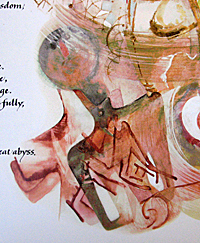 In other words, it is the place where one polarity becomes the other. The S shape can be seen as the distillation of the entire double spiral.” The spiral: symbol of birth and rebirth, the heart of the labyrinth, the spirit ancestor of our letter S.
Calligraphy’s practitioners today, at least in the west, are overwhelmingly women, and I would like them to know they are enacting a magical practice that is thousands of years old and very well may have originated in response to women’s mysteries as the life-givers. This of course is not taught in schools, but the research about these images is becoming more available. I hope it is remembered by the calligraphers of both genders at Saint John’s next week while everyone is admiring the new Saint John’s Bible pages, in the place that birthed and made possible this book. It is so good to see this oldest form of writing in this newest incarnation of Judeo-Christian holy writings. The nursing madonna with script on her body above is sister to a similar figure from the same time and place, a version of which appears in this “Praise of Wisdom” illumination from Sirach 24. Though she is genderless in this image, the original figurine has breasts too. The Great Mother is manifesting indeed. She has always been with us, but I believe she is now bubbling up from our bodies and hearts all over the world. Her forms and virtues have certainly been coming through my hands and work for many years. Note: This post evolved into a full-length essay entitled “Sacred Script” published in 2010, and available for download from the Library here. It is Turkish Tamgas. They are not exactly words or alphabet. They are signs of tribe etc.